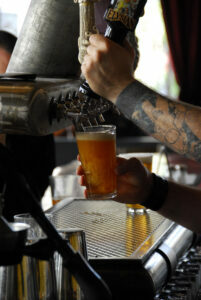 Photo courtesy of Elysian Brewery. Whenever one of my friends or family members comes to town to visit I get excited. It gives me an opportunity to share the local food and beer that I love and they might not have tried before. I’d even go so far as to say that one of the best reasons to come to Seattle is because we have awesome food and beer. Washington State has one of the highest counts of microbreweries per capita in the United States, and is in close proximity to the most bountiful hops producing region in the world. You could spend two weeks in Seattle and still not try everything we have to offer (okay, you could but I don’t want to be responsible for your liver or any ER visits). There is a conundrum associated with doing beer tours though; how do I get there and how do I safely get back to my hotel once I’m there? When my wife and I visited New York we took a trip out to Brooklyn Brewery on a Friday night. It was a great experience and taking the subway worked out perfectly for us. 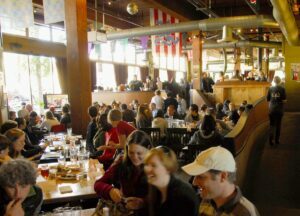 While Seattle might not have the same public transit infrastructure as NYC, you can get to almost all the great breweries and brewpubs in under 30 minutes by bus. 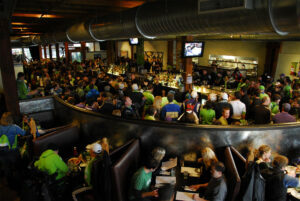 Elysian Brewery’s Capitol Hill brewpub. Photo courtesy of Elysian Brewery. I live on Capitol Hill and my wife and I will go to Elysian Brewery regularly to fill our growlers. They have a wide selection house-brewed beer, along with some visiting beers. 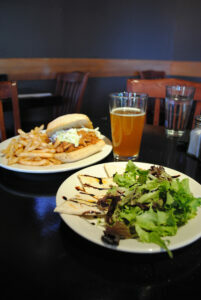 They offer brewpub classics like burgers and sandwiches with some more interesting entrees for good measure. They’re located at 1221 East Pike Street (with a location down in Pioneer Square right by the stadiums as well). From 3rd and Pike Street, hop on a 10 or 11 bus. Ride it until you get to the stop between 12th and 13th on Pine Street. Walk south a block along 12th until you hit Pike Street. My wife and I love Men’s Room Red Ale. 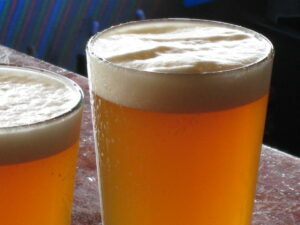 It’s got a nice hoppiness to it, is great to drink on its own or to wash down rich and spicy flavors with. There’s also Dragon’s Tooth Stout which not only is a great drinking beer but a great cooking beer. It has all the great characteristics of a stout but with less bitterness. When you’re making a stew with root vegetables such as parsnips and turnips, Dragon’s Tooth shines. If you prefer a lighter beer the Zephyrus Pilsner will not disappoint. Elysian Fields in Pioneer Square. Photo courtesy of Elysian Brewery. If you’re lucky enough to visit in October and early November, you will have the opportunity to try multiple pumpkin-based beers that they make. If you’re very lucky you might even visit on the weekend of the Pumpkin Beer Festival which Elysian hosts at their Pioneer Square location. Walk north until you get to Pine Street Cross the street so you’re on the North side and there will be a bus stop between 12th and 13th. Take either the 10 or the 11 back down to 3rd and Pine. Neither my wife or I drive so we almost exclusively walk or ride the bus to get around. One Bus Away has live data on busses such as when they will arrive and depart and how late they may be. King County’s online trip planner allows you to enter in address information and builds an itinerary. Streets run East West, Avenues North South in Seattle, with few exceptions. Marc Treyens is the Network Administrator/Helpdesk Technician at Visit Seattle. In his off time he enjoys eating and drinking around Capitol Hill with his wife, playing computer games, and cozying up with a beer and his orange tabby.